In my last post, I said "Most languages in the world take the alphabetic writing system. Studying the internal history of its vocabulary primarily means analyzing phonological and morphological changes through time." In this post,[note1] I'll expand on that point and contrast that with the Chinese tradition. late 13c., langage "words, what is said, conversation, talk," from Old French langage "speech, words, oratory; a tribe, people, nation" (12c. ), from Vulgar Latin *linguaticum, from Latin lingua "tongue," also "speech, language," from PIE *dnghu- "tongue" (see tongue (n.)). Source: A Comprehensive Etymological Dictionary of the Spanish Language with Families of Words based on Indo-European Roots by Edward A. Roberts, 2014. LANGUE, sf. a tongue; formerly lengue, from L. lingua. For in=en=an see § 71, and Hist. Gram. p. 48. — Der. langage, languette. Source: An Etymological Dictionary of the French Language by Auguste Brachet, 1882. I in Latin position [i.e. "when followed in the Latin word by two consonants" according to him, a convention not exactly the same as adopted today; my note] is changed to e in Merovingian Latin: thus fermum, ..., for firmum, ...' and this e, pronounced ei (see § 66), has produced two distinct French forms, according as it has preferred the open è sound, or the i sound. You can choose to follow up to rule 66 in this book and p.48 of his A Historical Grammar of the French Tongue for more information about these sound (phonological) as well as spelling (orthographic) changes. Western etymological publications may be divided into two groups: (1) dictionaries that give etymons or source words; (2) scholarly books and research articles on phonological and orthographic changes over time. Mr. Brachet's dictionary is unique in that it merges the two into one, so that the reader is conveniently offered the explanation of sound changes right in the headword entry, obviating the need to research as to why, e.g., the first i in *linguaticum would change to a in the history of the English word language. However, a word contains more than its sound and spelling, but its meaning as well, which etymology cannot avoid tracing. But as linguist Calvert Watkins warned us, it is "more hazardous to attempt to reconstruct meaning than to reconstruct linguistic form". Sense development is much less researched and also less described in dictionaries. Unlike phonology, semantics or the study of meanings of words is not easily subject to formal (as in "formal logic") structural analysis. And yet tracing the sense development is the primary task of Chinese etymology. Chinese phonological development is a separate field of study; it is not incorporated in etymology, because the meaning of Chinese characters (or words, whose meanings are almost always based on the component characters) is largely dissociated from the sound. Take the character 文 ("text") as an example. Translation of the embedded text: "文" is a pictographic character. "文" in oracle bone script (甲骨文) and bronze inscription script (金文) resembles a standing person facing forward. His chest bears tattoo of decorative patterns. This is in fact a vivid description of the ancient "文身" (tattoo) custom. Thus the original meaning of "文" was a person with tattoo on his body, as well as pattern, texture. Later, the meaning was extended to character, article, culture, civilization etc. That was a typical entry of Chinese character etymology. For simple characters especially pictographic ones, it is simply pure 依类象形 or description of the object according to what it looks like. The focus is on the meaning, not the reading or sound. Some more complicated characters may be decomposed into elements each of which is analyzed the same way, as in the case of "秦" (see my last post). Needless to say, the majority of the characters (at least 80%) are of the type 形声字 or characters of form and sound, such as "指" (finger; to point), where the form radical "扌" suggests the meaning, i.e. something related to hand, and the sound component "旨" suggests its reading , i.e. zhǐ. 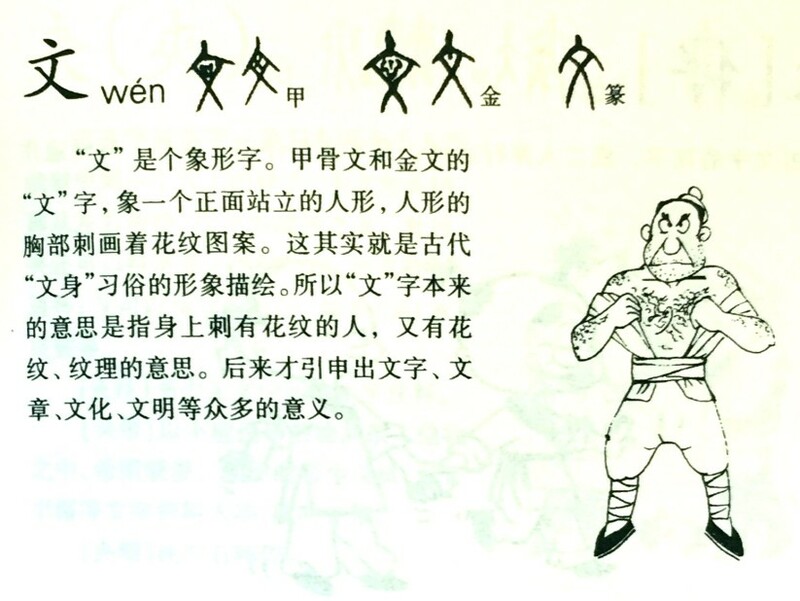 The classical Shuowen Jiezi (说文解字) dictionary, unsurprisingly, points out that this character "从手旨聲" (the meaning is based on "手" and the sound on "旨"). Similarities and differences between Chinese and Western etymology can also be revealed from the definition of the word etymology itself. The Webster dictionary defines it as "the history of a linguistic form (as a word) shown (1) by tracing its development since its earliest recorded occurrence in the language where it is found, (2) by tracing its transmission from one language to another, (3) by analyzing it into its component parts, (4) by identifying its cognates in other languages, or (5) by tracing it and its cognates to a common ancestral form in an ancestral language" (I added the parenthesized numbers). Thus we see that most western dictionaries with etymological information meet the requirements (1) and (2), sometimes (3). Wiktionary and Friedrich Kluge's An Etymological Dictionary of the German Language also meet (4) and (5) most of the time. What if we apply these requirements to Chinese character etymology? (1) is often met if we interpret it as finding the first occurrence in history, which nowadays is made drastically easy with the aid of a computer-based search. But tracing its development in the course of long history, either inside Chinese or (2) across different languages, is rarely done. (3) is done, though with significant differences from that in western languages. (4) and (5) are rare because they're mostly irrelevant to Chinese characters. How is analyzing a Chinese character into its components special compared to the western tradition? While a character e.g. "指" can be analyzed into "扌" (for meaning) and "旨" (for sound), there is no systematic change of a component from one form to another. Take rule 126, one of the many summarized by Mr. Brachet for French, as an example, "Before a, initial c ... passes through the successive aspirated sounds k'h, tk'h, kch, ch." He supports this rule of ca- > ch- with about 80 words as evidence, champ < campus, chien < canis, etc. Can we construct an analogy of this rule and find supporting examples in Chinese etymology? Since Chinese does not use an alphabetic writing system, there's hardly any need in dealing with the sound change of a character in etymology. Instead, we may substitute the change in form of a character. For example, after studying the 金文, 小篆, and 楷体 forms of "指" and other characters with "扌" on the left side, we may conclude that all (or most) such characters have gone through the predictable change of this radical in these forms, just as the French ca- changed to ch-. Similarly, all or most characters with "旨" on the right side probably went through the same change as shown here (see the row for 字源演变). Thus, we find in etymological studies a parallel between Chinese and western languages in identifying common component change in characters or words. However, Chinese etymological dictionaries are also interested in finding the "root cause" of the most basic characters. Because the characters are ultimately from pictographs in origin, this "root cause" finding is mostly "依类象形" (describing the object according to what it looks like). If we must find a parallel for this practice in western etymology, it is equivalent to answering the question why e.g. the Proto-Indo-European stem from which Modern English word word is ultimately derived is *were-, that is, why that sound. Obviously, except for some onomatopoeias, there is no answer, or no such research. While Chinese etymologists have forged ahead in that direction, so far this "research" is, I'm afraid, very much based on guess work, simply because there is no record left in history about why a specific character was invented to be of that form. "文" may indeed be a symbol for a person with tattoo, with no hard proof anyway. But this is too error-prone. In my last post, I quoted the article 许慎为何将象释成母猴——“为”字趣释 (Why did Xu Shen interpret an elephant as a female monkey: interesting interpretation of character "为"). In a recent weibo blog post, a scholar interpreted, purely based on its resemblance, "夷" in its original oracle bone script as a person squatting, while in 《汉语字源字典》 (Dictionary of Chinese Character Etymology) by another scholar in this field, it was thought to represent a man bound by ropes, to be served as a slave or for sacrifice. On this stretch of imagination, I have but one comment: "汉字字源，看图识字，见仁见智" (Chinese character etymology / Look at pictures and learn to be literate / Trust your opinions and beliefs). [note1] Due to the unique nature of the Chinese language, etymology can be of characters as well as words. This post is about character etymology.